Greetings. This special edition of Holsten Galleries News offers a sneak preview of the 2015 Studio Editions. I think that you will agree that these are not only some of the most beautiful examples of this popular small-scale series but also some of the most innovative and unique. I look forward to your comments and questions! The Amber Plum Seaform Pair is one of my all time favorites among the Studio Editions. 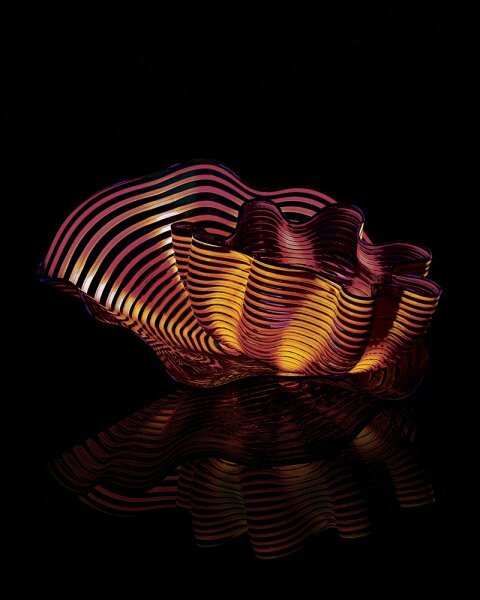 The Seaform Series, as many of you know, is one of Chihuly’s most longstanding series. The two elements in this composition are rather typical in form but the way they fit together is particularly stunning. 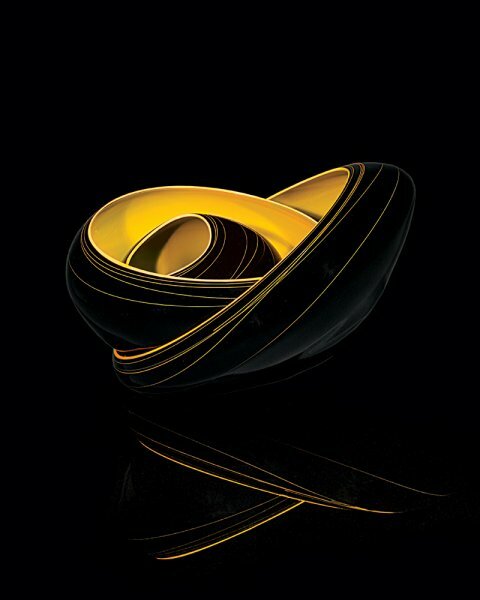 An unusual body wrap of contrasting velvety purple and tawny gold introduces tangible texture and accentuates the fluent motion of the organic form. 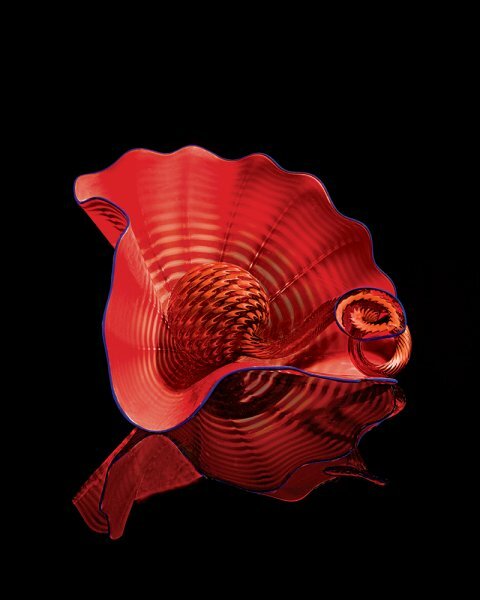 The Pomegranate Persian Pair is a classic example of one of Chihuly’s most celebrated series, the Persians. The agile, open form enfolds an eccentric element that curls out while drawing the eye into the composition’s complex interior. Two tonal body wraps combine to create concentric bands of rich red, deepening to ruby on the graceful ribbing that emphasizes the sculpture’s supple motion. The sapphire blue lip wrap articulates the expressive lines recurrent in this series. 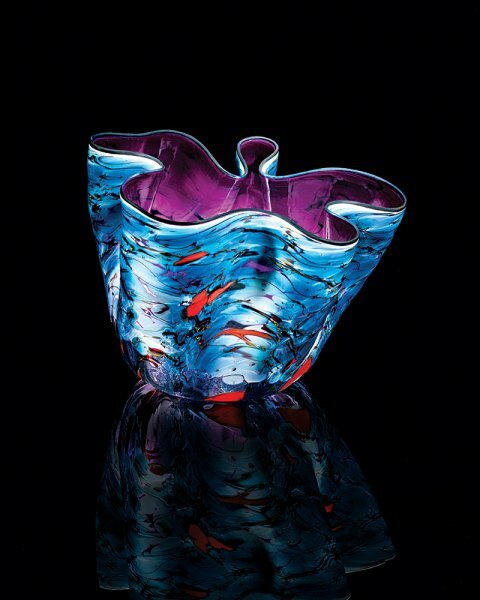 In Nightfall Macchia shifting hues of ultramarine, turquoise, and light aqua drench the exterior of the rippling form while bright crimson "jimmies," small chips of colored glass, are scattered across the surface, adding dimension and depth. The rich aubergine interior provides a profound contrast. Combined, these qualities contribute to the illusion of a beautiful gem mined from the depths of the earth, not created by breath and gravity. This piece harkens back to Dale’s earliest series, the Baskets. Unlike most of the previous examples of this series, Raven Black Baskets is a deliberate departure from Chihuly’s more typical vibrant kaleidoscope of color, yet the simplicity of the palette directs our focus to its strong sculptural presence. The saffron interior of each of the three Baskets creates a warm inner glow, set against the opaque black exterior. The same golden hue is boldly used for the lip of each piece.